If you or an organization is interested in having a direct impact on local families in need, please use the information below to make a donation. Click on the image to open the donor card in Adobe Reader. Donations are tax deductible. All donations go toward helping a family. 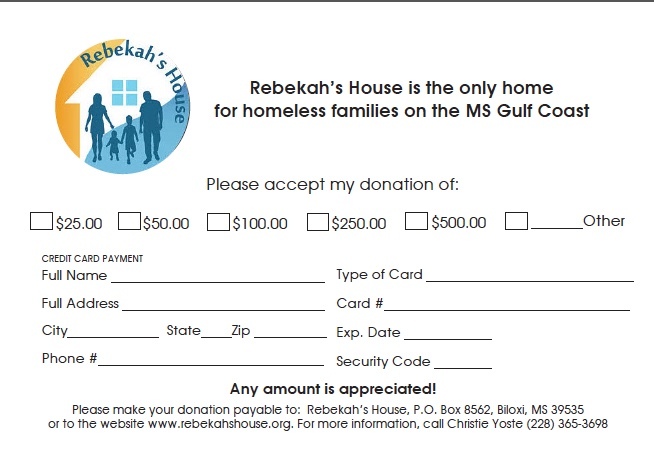 To give to Rebekah’s House online, make a donation to Ocean Springs-Long Beach Interfaith Hospitality Network through our account on Network for Good. Our most critical need is faithful monthly donations to help us meet our budget. This will help us pay for expenses such as the salary for our 24-hour case manager, insurance, utility bills, and maintenance. While we encourage guests to provide what they can to be self-sufficient, we like to help them in times of need on these items. Regular recurring needs: trash bags, paper towels, toilet paper, laundry detergent, dishwasher detergent or pods, hand sanitizer, Lysol, disinfectant wipes. Frozen foods: spaghetti, ravioli, chicken bake, mac and cheese, hot dogs, corn dogs, bread or buns, and canned vegetables. If you want to know more about our needs and what you can do to help, please contact the board at rhboard@outlook.com. Join our sponsors in making a difference in the lives of a family in need.